DEBORAH CROMBIE: We all know what HYGGE is, right? The word is Danish, and supposedly there is no direct English translation. But "a quality of coziness that engenders contentment and a feeling of well-being" supposedly comes close. So how do you pronounce this wonderful term? Hue-gah? Hoo-gay? Hue-guh? No one seems quite sure about this, either. But no matter how you say it, HYGGE has spawned hundreds of books and magazine articles and decorating trends. The Danes came up with the concept because they have very long dark winters and they needed to find a way to make those dark days fun instead of going out and burying themselves en mass in snow drifts or drinking themselves to death. So they concentrated on fuzzy hand-knitted socks and crackling fires and perfect pots of tea, and on candle-lit homey gatherings of friends and family around home-cooked pots of stew. (Do they use Le Creuset in Denmark, I wonder?) Then, they throw in READING. Now that sound pretty hard to beat, and just the ticket for those of us who are feeling a bit battered by this last year. 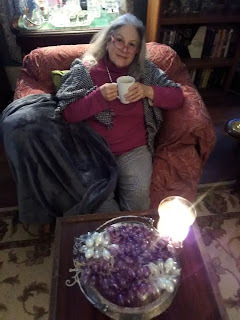 Of course, it occurs to me that I have been making perfect pots of tea for years, and that I already have fuzzy socks, and that there are few things I love more than reading in front of the fire, or warm cozy dinners with family, or drinking wine in my kitchen with my very best friends gathered together. But apparently the secret to HYGGE is that you should do those things consciously, with appreciation for the moment. Debs with fire, fuzzy socks, candle, and her furry friend, Chewbacca. REDS, do you practice HYGGE? INGRID THOFT: YES!! How could I not, with a name like mine? One of my nephews refers to his sweats and p.j.s as his "cozies," and the whole family has adopted the term. I like getting into my cozies and curling up on the couch with a good book. Even though I have the Danish blood, I think my husband taught me about coziness and a feeling of contentment more than anyone else. I grew up with an inclination to always be productive, but early on in our relationship, he showed me the value of slowing down and recharging one's batteries. I think a lot of cultures do it better compared to Americans when it comes to self-care and creating a sense of community. I'm all for productivity, but much can be gained from taking it easy when given the chance. Also, aren't the Danes one of the happiest groups of people on the planet? Perhaps they're on to something. Do you know how much I love Ingrid's photo??? 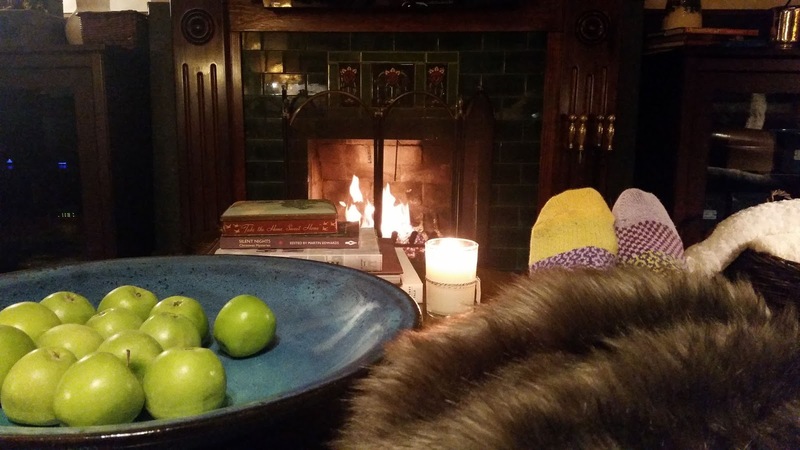 HALLIE EPHRON: HYGGE? I'd never heard the term, but "slowing down to smell the roses" and being content in the moment and indulging in friends and good food and staying warm... high priorities for me. All year 'round. My favorite winter clothing: silky long underwear -- not the waffle weave cotton stuff that bunches up in your pant legs and armpits. That thin extra layer really works, and there are brands like Cuddle Duds that aren't expensive and feel great. And I confess I'm into warm winter socks in a big way and sometimes, when it's really cold, I wear my Uggs boots around the house. They weren't cheap but one of the best investments I ever made... five+ years ago. My favorite cozy activity does not involve friends... a hot bath. The original bathtub in our 1920s house is large and has a sloped end and I can submerge everything but my knees. Mmmmmm. 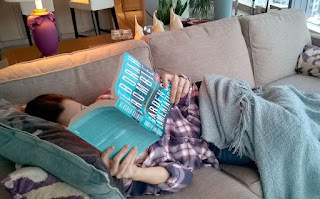 HANK PHILLIPPI RYAN: Jonathan and I say it all the time: Cozy! 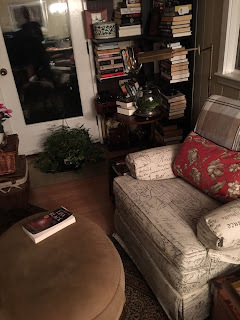 We have two cozy chairs--and either one may be occupied by either of us so we don't have "my" chair--and sweatpants and fleece tops and fuzzy blankets and watch some great movie with wine. Kidding me? Fabulous. Also! Jonathan makes coffee for me every morning. When I hear the sound of the spoon stirring in the milk, I know this seems silly, but I think, wow, I'm lucky. And how about that moment when you first get into bed, and the comforter and pillows are all puffy? RHYS BOWEN: I am not a winter person! If I had my way I'd hibernate and wake up in March. I know this is wimpy because California winters are not harsh, but usually I escape to Arizona and this year John's health issues are keeping us in very wet and windy Marin County. So for the first time in ages I'm having to create my Hygge (I'd guess it's hooguh). I do love my Uggs. Brought them back from Australia in the days when I went back and forth all the time to my parents and now wear them in the house all the time (my, but they hold up well!). Candles. I love candles on winter evenings and I've kept up some of the sparkly little lights. And I'm knitting scarves and I love mulled wine. And I'm making lots of soup. I'm lucky enough that two of my children live nearby and I really enjoy impromptu visits from them. And going to movies and having lunch with friends. I think we need lots of contact with people we care about to get us through the dark time of year! DEBS: Oh, I am with Hallie on the bath. And with Hank on the puffy down comforter when you snuggle into bed at night. And candles and soup and friends for wine, and purring (or snoring, as the case may be) animals. I don't have to mention how I feel about tea... I make a perfect pot with a perfect cup every single morning, and it is a highlight of my day. You can't get much more HYGGE than that. Although I would certainly try. (Maybe we are transplanted Danes, although Ingrid gets first claim!) But what do the Danes do in the summer?? READERS, how about you? Are you into the cozy Danish HYGGE thing? P.S. I love everyone's houses. How fun to see them! Well, I may not have known the Danish name for it, but there’s not much that beats getting comfy, putting a pot of chowder on the stove, having a cup of tea in hand, and spending time with loved ones and friends, or curling up with a good book . . . .
We are all kindred spirits, apparently! My absolutely favorite activity in the winter is to build a big fire, have a cup of herbal tea or a glass of wine, snuggle into my chair with my alpaca socks (I buy one pair a year at the Wool Festival) and a cozy throw, put my feet on the stone ledge of the hearth, and read. If that's hygge, then I'm already an expert! Debs, you ask what Danes do in the summer? That's even better! For two weeks in July, all of Denmark's businesses shut down, and the whole country goes on vacation. Most Danes take to the water on their boats . . . Yes, the Danish term Hygge has been getting a lot of focus lately. One book I saw was called "The Little Book of Hygge: the Danish Way to Live Well" by Meik Wiking. Wiking is the CEO of the Happiness Research Institute in Copenhagen. Denmark is often ranked to be the happiest country in the world so they must be doing something right! Considering we have @4 months of winter here, I don't really have a cozy, snuggle up kind of retreat at home. But I do apply some of the factors related to achieving hygge all year round: good food and drink, comfortable clothing, and reading. We no longer have a fireplace or wood stove and I miss it. But a fleece blanket, a scarf around my neck, a good book, and a glass of wine? I'm there. 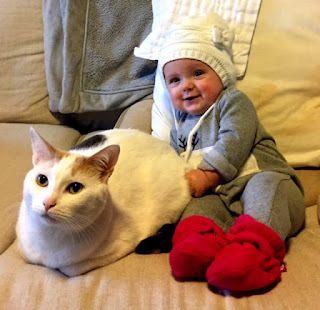 With a cat or two for extra warmth, of course. Oh, Dorothea! Just looking at he makes me feel all warm and cuddl. My one gripe about winter and the need to nest is that it's not conducive to writing. My office is cold and I'm most productive sitting at my desk. Yes, I have a space heater. Just have to figure out where. When we moved into this house, I promised the boys we'd have a couch big enough for all of us to snuggle. Eleven years on and that comfy sectional is still the place we gather to curl up under fleecy blankets (yes, with fuzzy socks), grab a book or a movie, something good to eat, and enjoy the evening--cats optional, although they usually seem to enjoy it as much as we do! And I agree, Dorothea is a cuddle-babe! And, Ingrid, lucky, lucky you with Deborah's latest!! Never heard the term Hygge before today, but I certainly practice it without knowing. Nothing better than my comfy clothes, a good book, a quiet corner, and a hot drink to pass a few hours - or days. LOL. WHere to put the space heater! SO funny. If it's too close, it's too hot. If it's too far, it doesn't work. For writing in winter, I wear: fuzzy slippers, sweatpants, t-shirt, waffle shirt and fleece hoodie, than I wrap a flannel blanket around me like a towel, and add fingerless gloves. I look like the little match girl. The Hygge-outfit! First let me say, Lucy, the picture of Dorothea and Zuma absolutely melted my heart! What sweeties!!! I was unfamiliar with the term Hygge until it suddenly started popping up everywhere as well, but have gradually grown to adopt it. I don't really remember this from my childhood or even early adulthood, but I'd say that over the past ten years or so, my husband and I have come to really value and look forward to spending maybe the last hour of each day, plus some weekend time, curled up in fleece wear, with me most often in two pairs of socks, sipping a warm beverage. The one slight variation for us is that often we're reading but other times we watch something from the Acorn collection on Netflix. It just feels slightly more companionable, enjoying a British mystery together that way. We have a down comforter on our bed and it is divine. And The Girl not only has the comforter, she has this fleece blanket from Columbia that is so silky-soft and warm it should be illegal. And we have two heavy wool blankets to wrap up in while watching television. We have a cast-iron wood-burning stove (with a clear front so we can watch the flames) in the living room and noting banishes the winter chill like a nice roaring fire. Add a book and a mug of hot chocolate, and I don't really want to move. A new thing for this year is a small TV in our den/library. It only does Netflix. The Hubby and I can curl up on our reclining love seat, pull one of those wool blankets up, and binge-watch TV in cozy comfort. Hallie, we also have a bathtub like that. Not quite long enough to submerge everything, but a nice hot bubble bath, cup of tea, and a book is a great way to wind down the day. Hank, I too have a husband who makes me coffee every morning and it is a small and hugely wonderful thing. Hallie, have you ever tried a rice bag? They're super easy to make: a quarter-yard (or less) of sturdy fabric--I usually just use whatever is lying around, but you make one out of a dishtowel--and a pound or more of rice. Lavender buds optional-1/4-1/2 cup. The fragrance is very soothing when the bag is warmed. Fold the fabric or dishtowel in half; stitch securely up both sides. Machine stitching is best. Turn, if you're using fabric (in which case you will want to sew it inside out, and then turn), or just hold open the end, and pour in the rice. Carefully match the ends, pin, and stitch together securely. You can heat in the microwave, depending on your oven, 2-4 minutes. The rice will hold heat for a long time, especially if the rice bag is under a blanket, or close to your body. My husband drapes his on his neck while he's working; I like mine on my lap, or under the blanket down by my feet if I'm chilling on the couch. This is the ultimate hygge! Hallie, I used to take a steaming hot bath every night, but our water heater temperature is too low to make an entire tub full of water that hot. I mourn. And make do with a shower. Karen, I have slippers that are filled with barley(I think) & lavender... warm in the microwave and slip them on for a quick warm-up. Walking around in them is a little tricky because they are lumpy. This weekend I saw a piece in the paper about hot water bottles? Anyone else see it? Old fashioned rubber are the best... we always had one in the house when I was growing up. I'm off to the Internet to find. What a lovely concept! Although we don't call it that, I see we practice hygge all year round up here on the tundra, sans wooly socks in the summer. Usually this is the Sunday afternoon activity. We have the New York Times, lots of LLBean wool socks, and books. Or a binge watch, like yesterday, "Sneaky Pete", with Bryan Cranston and Margot Martingale, which if you haven't seen, you should. Julie is a choral singer, sings Sunday Mass, but as soon as we are home, its time for soup and hygge, the paper, a fire and maybe popcorn later in the day. Life is good. Wow, I feel good just reading about hygge. Hygge is a wonderful idea. I was reading about hygge in the Sunday New York Times around Christmastime. On Christmas Day, I decided to "hygge" and stay home. I love that idea and put it into practice. Unfortunately, because of "Spare the Air" in California where I live, we cannot use the fireplace. I remember when I was a kid that we had the fireplace lit to warm up the living room on cold wintry evenings. Someone mentioned hibernating. I would prefer to hibernate in the winter too. I read the Twelve Clues of Christmas on Christmas Day and just relaxed. We celebrated with family on Boxing Day. All you cold writers out there, I have the answer!!! It's the DeLonghi HMP1500 Mica Panel Heater. (And, no, this is not a sponsored comment, lol.) But these things have changed my life. Unlike the ceramic space heaters that blow hot air, so that you are either too hot or two cold, these radiate, are silent, safe, and infinitely adjustable. In the winter I used to have to retreat to my upstairs office, but now can write in all but the coldest weather in my sun porch (ten OLD glass windows) which I much prefer. I have two mica panel heaters in here now. P.S. the cats and dogs love them, too. And they are $80 on Amazon right now. I think we all have the same winter writing outfit: mine is sweatpants (Land's End), warm socks, thermal long-sleeved top, and fleece hoodie. And I wrap up in a lovely Ralph Lauren fleecy blanket that a friend sent me for Christmas. Bliss. Maybe we should do a JRW writing fashion show. I love taking baths, Halle, and then I love to put on my cozies and move to the couch where I read a good book under a throw. Now all I need is a chef mixing up something aromatic in the kitchen! And this time I spelled your name wrong, Hallie! I must have been putting a Danish twist on it! I love this concept - Hygge - and this is the first I've ever heard of it. I live in a frat house with three musicians so "cozy" is not the first word that leaps to mind - it's more a loud, smelly, loud, boisterous, loud sort of abode. Honestly, I have no specific spot in my house to unwind and read unless I count my bed right before I pass out at night. I have a nest of pillows that I crawl into and then pull one over my head. Did I mention how loud my house is? LOL. Jenn, we need to help you create a soundproofed hygge spot. (I'm beginning to see why you write standing up in the kitchen!) And how do you ever manage to read?? A writing wear fashion show? SO hilarious...that would be tragic! Have been reading articles on hygge lately.....such a great concept. With all the rainstorms we are having here in California (thankfully!) I am enjoying the coziness that we have created. However, after just receiving our latest gas and electric bill....we have cut back on using our gas fireplace.....$$$!! Susan Emerson commented "other times we watch something from the Acorn collection on Netflix. It just feels slightly more companionable, enjoying a British mystery together that way.". Can Susan or someone else tell me how to find Acorn programs on Netflix? Thanks! P.S. I'm another lucky one whose husband makes me coffee every morning......a sweet loving gesture that is a big deal to me. Love the post Reds!! The pronounciation site I went to gives "hugh-gah". Flannel jammies and a fleece robe. 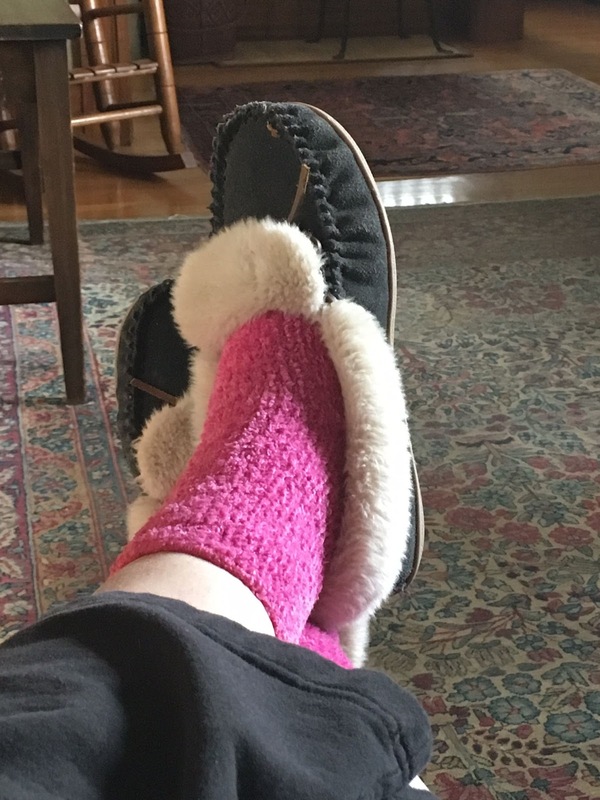 My favorite writing clothes in winter, though a little embarrassing if the UPS man rings the doorbell at midday. Or a fleece blanket to cuddle under while watching escapist tv. Cozy as can be. Hot cocoa goes well with this! A splash of orange liquer in it is nice, too. I meant to add a "smile" for the baby pictures. Babies and small kids get the hygge concept! My 3 year old granddaughter requested slippers this winter. I found them in furry purple and added a purple fleece robe. Gigantic hit. I heart flannel jammies. Harder to find now since Lanz's went out of business. Love hot cocoa from my favorite cafe. Terrible at making my own cocoa - it never tastes as good as the way they make it at the local cafe. For my birthday, I received a fleece blanket, which I love! To Helen in wet California, I apologize, I misspoke. Acorn is a separate pay streaming service that we have on our Roku. However, not to sound like an ad for them, but it is very inexpensive. Whereas for most other services we pay a monthly fee, I feel like we got a whole year of Acorn for something like $49.99. I recommend it heartily! I think we're all on the same fashion wave-length :-) Sweatpants, thermal henleys, fleece or sweatshirts, wool socks. I rarely have to wear my uniform these days. Houston just doesn't get that many cold days but when we do they're so chilly damp they're miserable. In Ohio and Minnesota I'd wear some sheepskin booties around too in addition. Haven't had those on in years. I don't even know if they're still in my closet! I love this idea of hygee! I guess I'd been doing it for years and just didn't know what it was called. I think most of the readers and authors I know are pretty familiar with this concept, even if they don't call it a hygee. Nice to think of so many others enjoying it. I feel like my whole life is cozy. I am a big supporter of pillows, slippers, coffee or any other hot drink, cake, and a mystery on the TV. Even in the summer! Susan, I subscribe to ACORN, too... it's a bargain IF you like BBC which I do. Vera. The Detectorists. And lots more terrific shows that I didn't even know exist. Thanks Susan for clarifying about Acorn....Will look into it. Hallie, since I am a big fan of BBC......Will probably like it. Can you stream Acorn to a tablet? Diane, Vermont Country Store catalogue carries flannel p.j.s.....including some Lanz nightgown. Diana, yes, Vermont Country Store has some Lanz products, but most of my flannel pjs' come from Lands End. Jersey top, flannel bottoms. Perfection. Sounds wonderfully warm and fluffy and I am presently freezing! Blankets, cats, warm sweaters and tea, count me in! I lived in Denmark for about 5 months with a Danish host family and I was able to experience how the Danes do hygge. It was absolutely magical. So many long dinner parties, meals shared at the table as a family, always with candles, tablecloths and many different homemade dishes of food. So many candles, always candles, and fires in the wood stoves. And lots of floral and botanical arrangements, my host mom would go out in the Forrest with her basket gathering moss and evergreen branches to make these Works of art. I try to incorporate some of these things into my life every day and always feel better when I do. In answer to your question: In the summer, the Danes absolutely worship the sun and time spent outdoors. They judge the quality of their life and their parenting by how much time their family spends in nature. They know summer is short so they stay up late, eat alfresco, sunbathe and generally soak up every bit of summer and togetherness they can find. These people know how to live well!